There was a time when Cinco de Mayo meant tequila, nachos, and, well, more tequila. 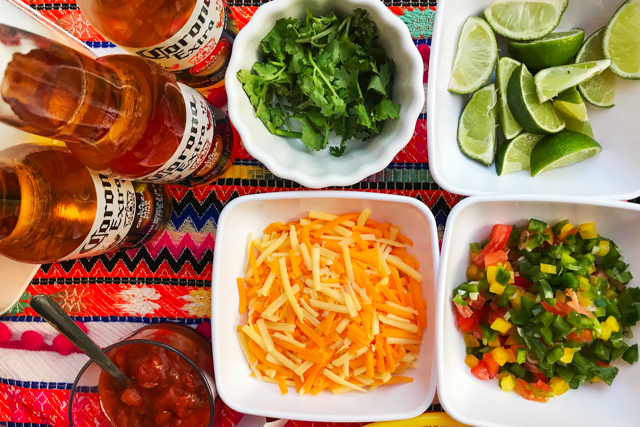 But, as we are trying to stay healthy, we’ve dialled back the drinking and dialled up the family-friendly fun so that we can all enjoy a Mexican fiesta on the fifth of May (which is today)! 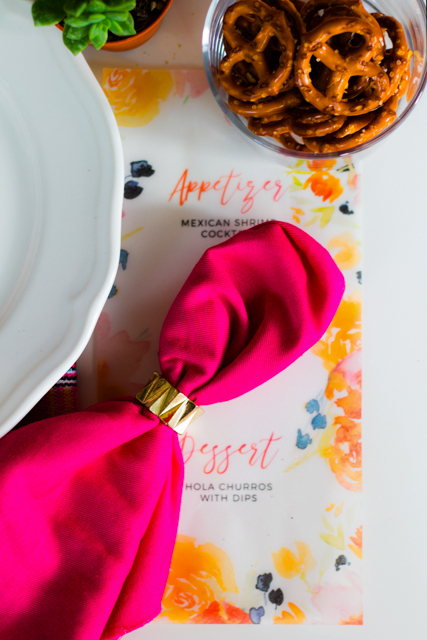 Fiestas aren’t just for Cinco de Mayo! 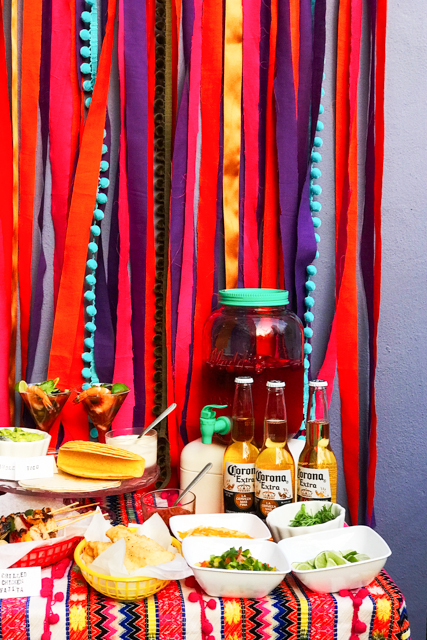 A south-of-the-border party theme is a great choice any time you want to kick back with a pitcher of margaritas and good amigos. 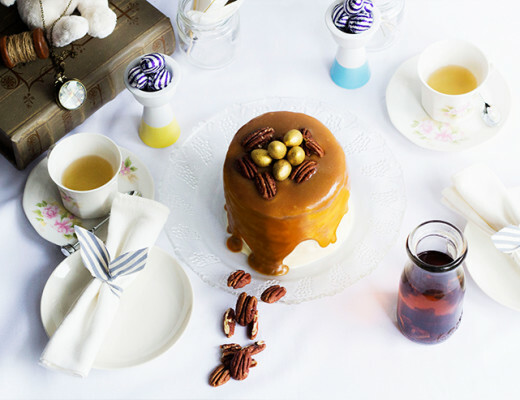 Snag our ideas for decorations, cocktails, appetisers, main courses, and desserts. So now let’s get started by sharing ours! First and foremost, Cinco de Mayo means Mexican food. 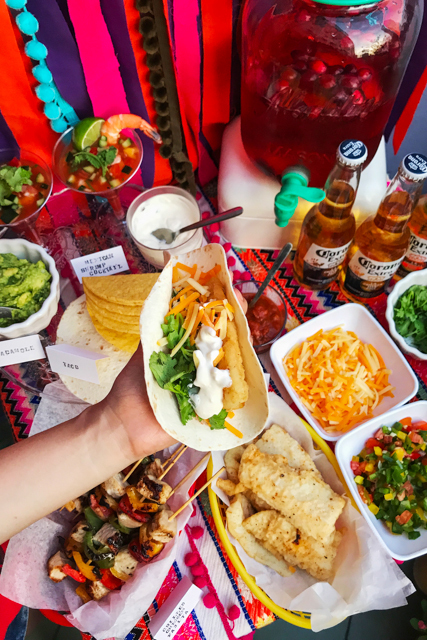 If it does in yours, too, set up a colourful taco bar along with recipes for taco fish, lime chicken, chunky salsa, and a mini soda bar. You may find that even your picky parents are more willing to try some new things when they are displayed beautifully like this. 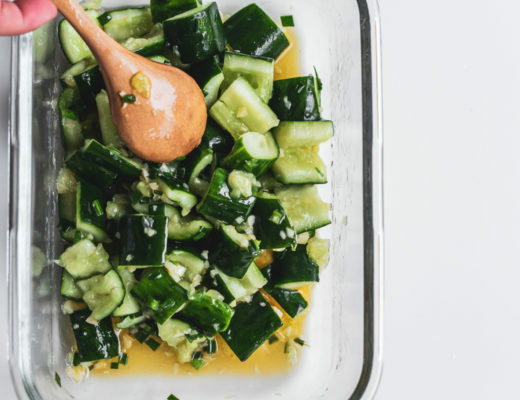 We love that you can choose to make this as fancy or as basic as you’d like, using homemade or store bought ingredients, with as many toppings as you have time to put out. We also have a wide range of side for our family, allowing a theme to mix and match to their preference. We have 2 kinds of mains to choose from, Battered Tilapia Fish and Grilled Chicken Fajita. Battered Tilapia Fish: The fish cooks up in literally minutes, so it doesn’t take long to get these beautiful bowls on the table especially if you are using leftover rice. The sauce takes 30 seconds to mix together. 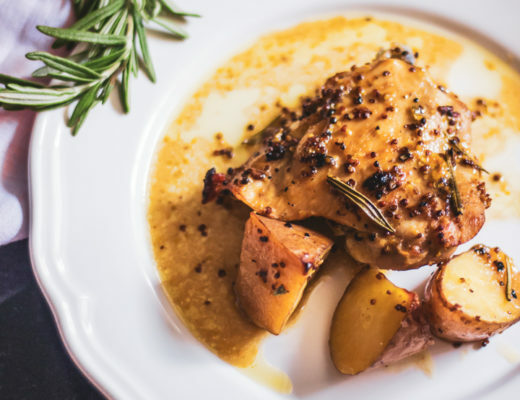 This recipe is customization with whatever ingredients you have on hand. Other fish options are mahi-mahi, cod, or halibut. 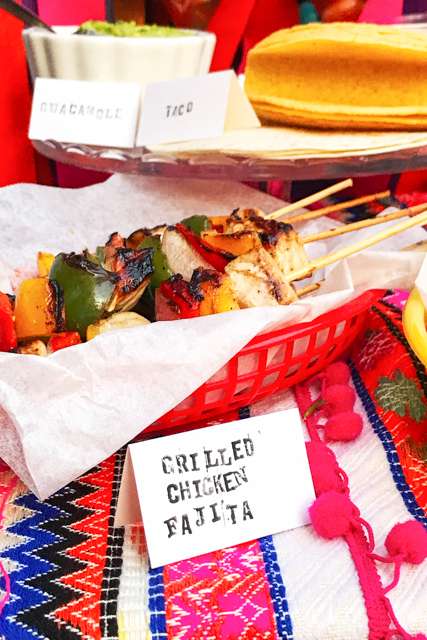 Grilled Chicken Fajita: They were really simple and fun to make. We made my own fajita seasoning with a blend of chilli powder, cumin, garlic powder, and salt. After seasoning tossed the cubed chicken in it. Then we put the meat on a skewer with a mix of yellow, and green bell peppers, and red onion. We gave the kebabs a little sprinkle of salt and sent them out to be grilled. The nice thing about skewer recipes is that they cook pretty quickly on the grill since the meat is already cut into small pieces. To accommodate the mains we have different sides for it. Start with Homemade Guacamole is definitely a staple of Mexican cuisine. Even though Guacamole is pretty simple, it can be tough to get the perfect flavour. With this authentic Mexican guacamole recipe, though, you will be an expert in no time. You’d better make a double batch. Of all of them. We also couldn’t be missed to have the Mixed Salsa. A pile of fresh veggies and best lime dressing to make one of the best chips dips – EVER. Mark my words, after one taste you will be shovelling chip after chip piled high with the stuff into your mouth. We also prepared bowls of cilantro, cheese and different sauces for the tacos bar! You can start by sitting the tortillas, guacamole, and mixed salsa on the table when the skewers finished cooking and then we pulled everything off the stick (Or place the juicy battered fish on top), wrapped it up in a tortilla and dug in! So now, Cinco de Mayo is rolling around and we’re getting into the Mexican food mood. 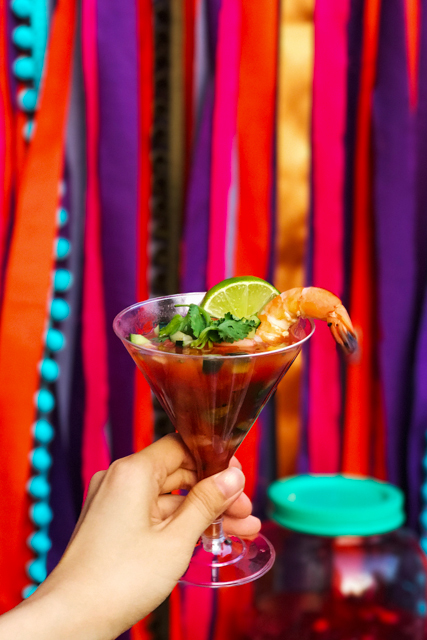 Mexican Shrimp Cocktail is almost like a “salad in a glass”. A chock full of crunchy vegetables and shrimp in a spicy, tangy tomato sauce. What’s not to love? We’re an onion-lover from way back, but it can be on the strong side for many people. Rick provides a great tip in the Panna app for removing some of the bites. After chopping the onion, place in a sieve and rinse it briefly under cold running water. Enjoy! It wouldn’t feel like Cinco de Mayo without festive beverages and we especially love the kick of a good margarita to get our party started. Thus we also prepared a topical lemonade and Mexican beers for the family. 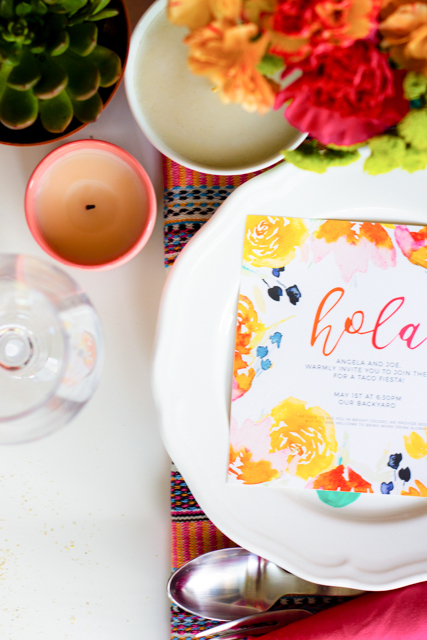 Cinco de Mayo is all about the fun and bright colours. Thus we also set out a colourful tables setting for our guest! 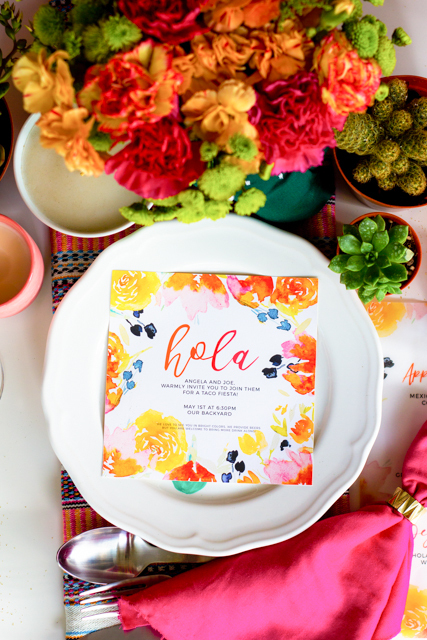 Start by making an invitation card for the guests to your Cinco de Mayo bash with these festive cards – a flower wealth water painting card. With the same flower water paint, we did a menu to highlight the different dishes that we have made for the party. Leave us some comment is you want the template for this printable. 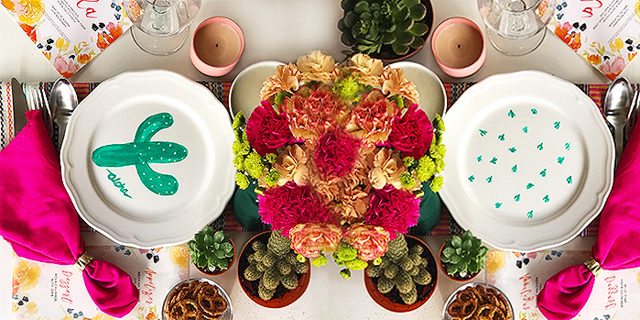 We also painted cactus to our plates as a fun and bright elements! Pink and Orange is the main colour for the party as we want to bring more warms to the family. 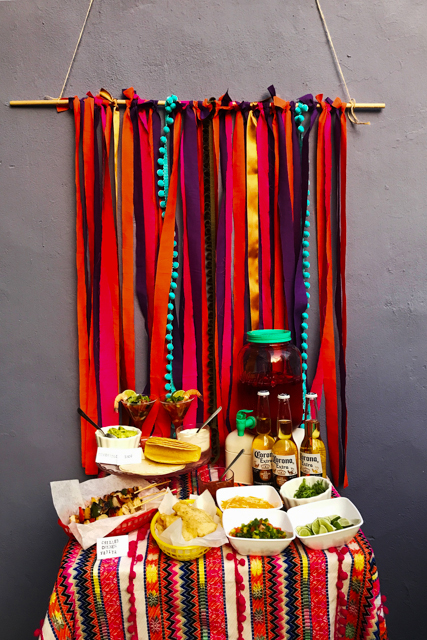 We hope this gives you a few ideas as to what to take to your next Cinco de Mayo and also a little insight into my world and how we do a picnic. Hope you like them! Share with us your version! Take a photo of yours, send us an email, tag us on Instagram, tweet us, anything. We love to see yours! A Happy devil, and let us know what else you come up with!